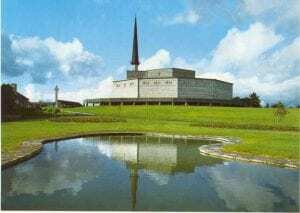 Knock shrine is Ireland’s National Marian Shrine. Located in County Mayo, on the Spectacular Atlantic West Coast of Ireland, the area has a wonderfully rich history and many charming towns and villages. The story of Knock began on 21st August 1879 when Our Lady, St. Joseph and St John the Evangelist, an altar, cross, and lamb appeared at the south gable of Knock Parish Church. The apparition was witnessed by fifteen people both young and old. From this miraculous occurrence Knock has grown to the status of an internationally recognised Marian Shrine. Coach from Nailsworth, with a pickup in Stroud and Stonehouse to Bristol Airport. Irish breakfast at our hotel. Mass will be taken in the Apparition Chapel. Guided tour of the Shrine grounds. Visit to Knock Museum. Free time for private prayer, confession, shopping or have lunch in one of the cafés. At 2:30 join the main ceremonies at the cathedral. Visit Ballintubber Abbey for guided tour (and mass) Travel to Westport for a walking tour and the opportunity to have lunch. Visit to Croagh Patrick Visitor Centre and walk to the statue at the base of the pilgrim's path. Also, visit the national famine monument and Murrisk Abbey. Mass in the Apparition Chapel. Possible visit to Foxford woollen mills en-route to Knock airport, depending on flight times (which are subject to change). Flight from Knock airport to Bristol on arrival we will be met by our coach for a transfer to Stonehouse, Stroud and Nailsworth. A single room supplement will apply of £75.00 for sole travellers.